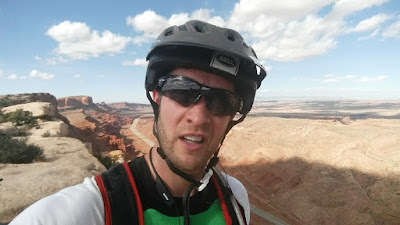 I had been to Moab, UT three times to go riding for a grand total of maybe 25 miles over the years. My first two trips were way back in '95 & '99!! 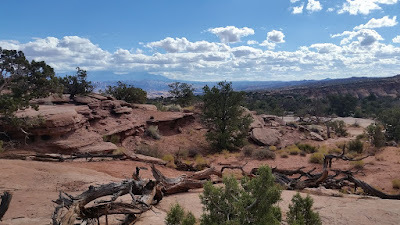 Yeah, I had done some of the famed Slickrock trail, which was a unique experience. 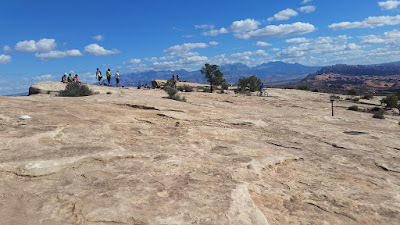 I did some loop on a 4x4 route called Fins 'n Things where the route was painted on the rocks using Stegosaurus images. Then, last year I did a short loop on Hymasa & Captain Ahab. 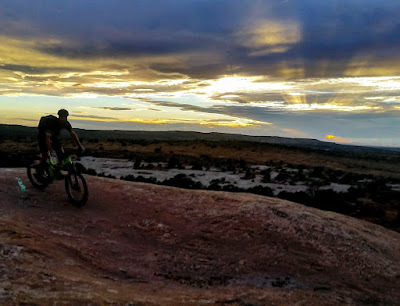 That short ride rekindled my interest for a more extended stay in the rock playground. 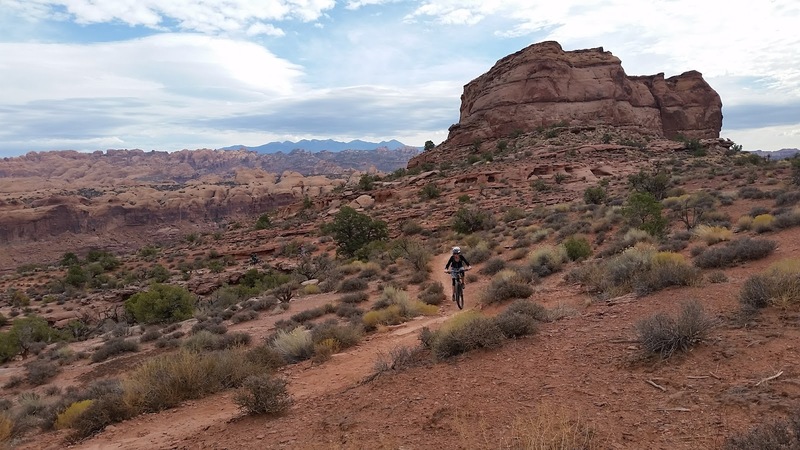 I think the idea of a weekend getaway to Moab first came up during the Mogollon bikepacking ride. I knew I'd be all out of vacation time, but could squeeze a solid 2+ days worth of riding in if I left on a Thursday afternoon. Kelly was game for the quick turnaround, she's said she'd drive all the way up there just to ride The Whole Enchilada!! (TWE) That's some dedication. She's been there more than me, so she put the ride itinerary together. Almost all of it would be new-to-me. Perfect. I also knew I didn't want to take the Voodoo on this trip. 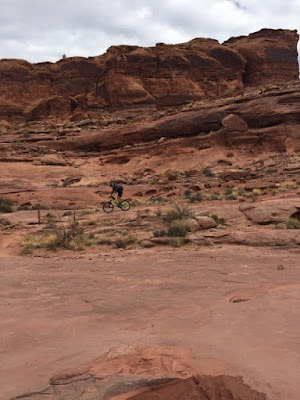 I'll take that bike on anything, but I really wanted to experience Moab the way it was meant to be. 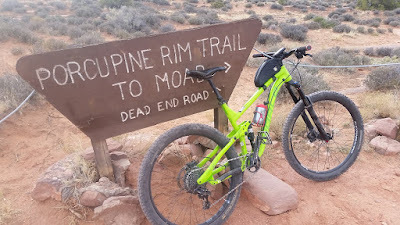 I booked a 3-day rental from Chile Pepper Bikes on a Norco Sight A7.1 27.5 full suspension rig. I just hoped I would get used to it quickly. Kelly reserved a couple of shuttles for us on Sat. & Sun, doing the Mag7 & Whole Enchilada routes, two of the more famous rides in town. As the weekend approached, I kept an eye on the local weather. 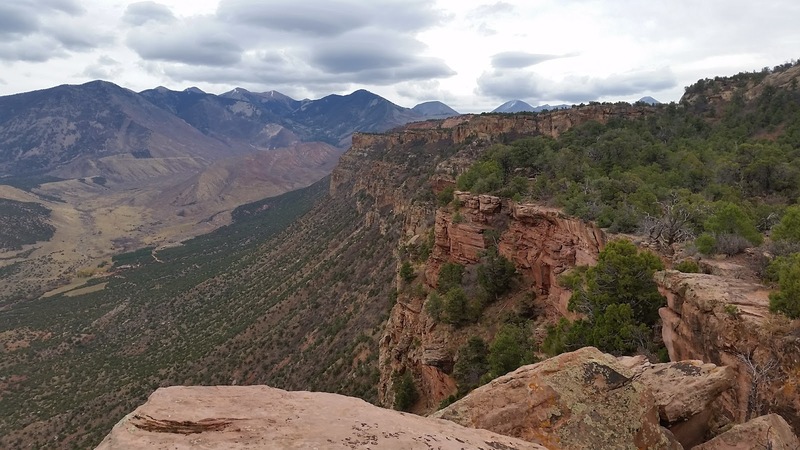 A small storm moved over the area on Tuesday and closed off the upper drop points of TWE. I thought if it dried out and warmed up as forecast, we may get lucky by Sunday for the entire route. There was plenty of riding to do beforehand though. I pinged Scott for some dispersed camping options and he led us to an area north of town off Willow Springs rd. We'd be arriving late on Thurs after working, plus the hour timezone difference. We found a spot good enough to crash out sometime after 11p. Good enough for a few hours of zzz's. There wasn't exactly a rush to get moving the next day, but we were heading into town at a reasonable hour. We made our way over to Chile Pepper Bikes to pick up my ride for the weekend. A quick spin around the parking lot felt fine so off we went. First up, Pothole Arch. 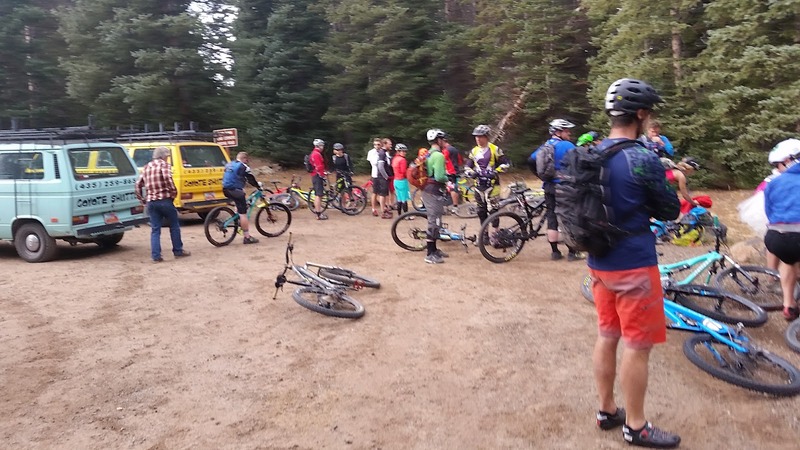 The lower trailhead was already buzzing with riders. I was about to see how this bike handled on the techy climbs before testing it out on the fun descents. We picked our way up Hymasa and so far I was pleased with how it climbed. My first action shot! Photo by Kelly. 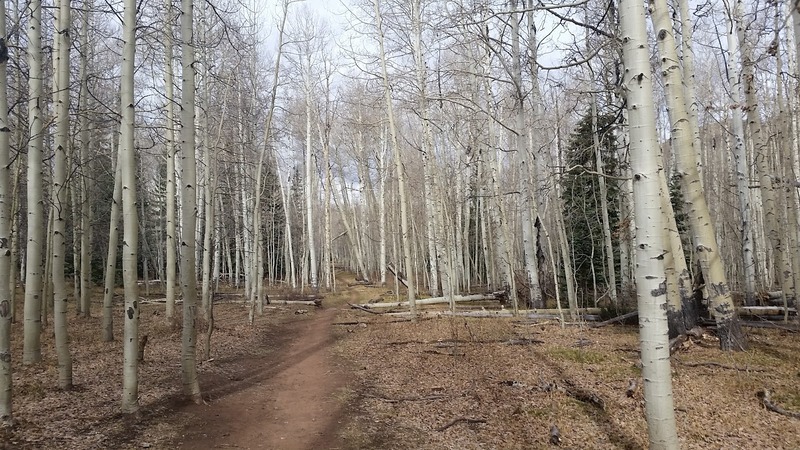 A rare stretch of smooth singletrack. 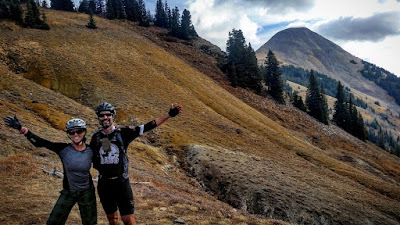 At the top of Hymasa we verified our route with some other riders, yet I somehow misinterpreted the 'don't take the right turn' and led us down a short bit of chunky jeep road that we had to HAB back up. Sorry Kelly!! The first test of chunk riding, almost cleaned it. Photo by Kelly. 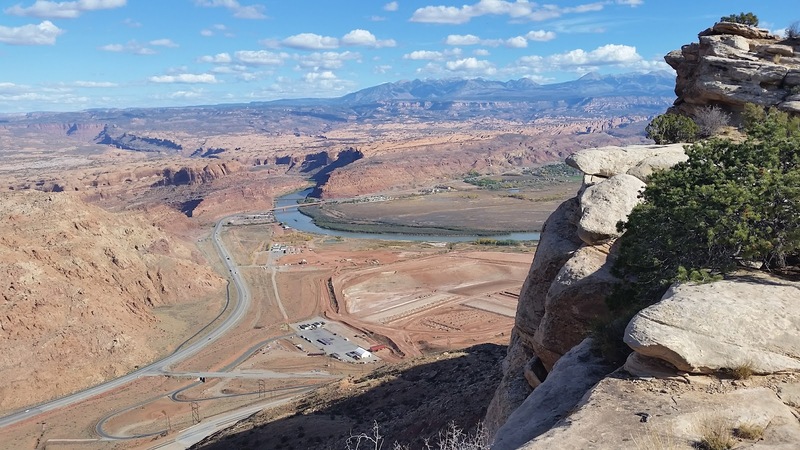 Everything in Moab seems to hug a cliff. You're either riding on slickroack via paint marks or rock slabs. Our turnaround point at Pothole Arch. Fun area to play around. 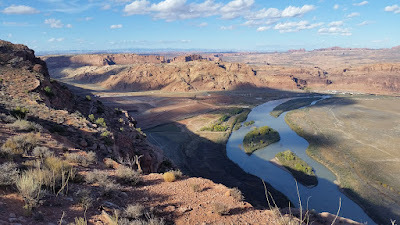 The Colorado River gets plenty of show time too. My camera lens got dirty for a few snaps, but this still came out cool. 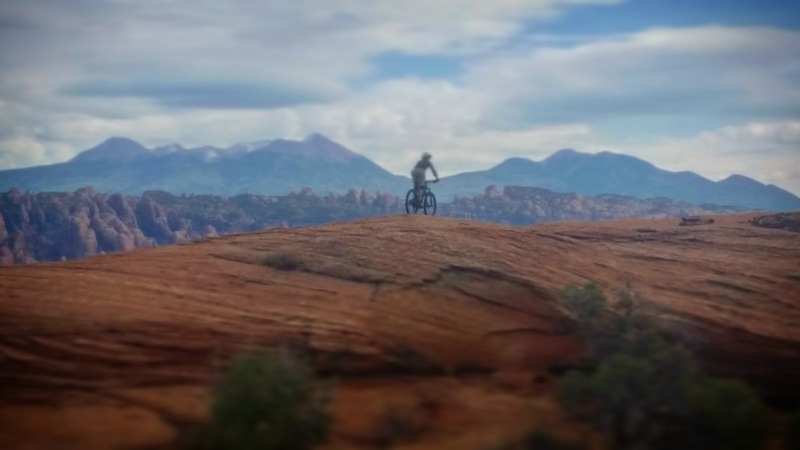 Slickrock freeriding. Photo by Kelly. 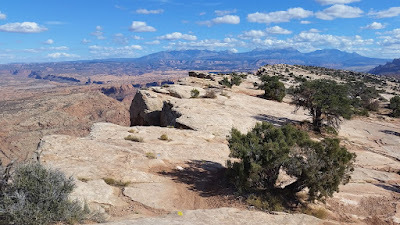 On our way back we took another wrong turn and did a short bonus loop on the jeep road. Soon enough we were back at the top of Capt. 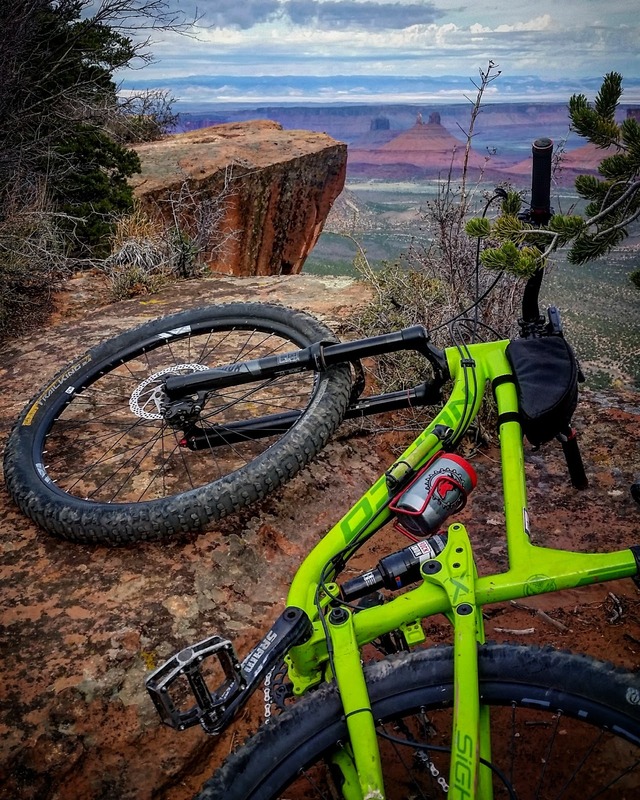 Ahab trail. 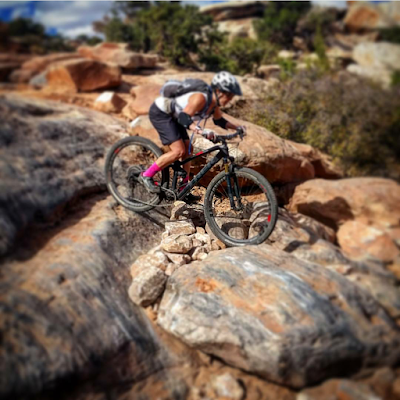 Kelly was looking to go fast on her first ride on this trail, so she set off to find a good leader since there's no way I could keep up!! This first bit of trail winds around as it gains the high point. I caught up there, only because the large group in front of us was poking around. We managed to latch onto a couple of German guys who were up to the task, I just hoped to keep all three of them in my sights. All in all, I didn't fare too bad. I did balk at a drop or two, but otherwise didn't fall too far behind. We re-grouped a few times and on the last one the discussion of stopping to check out a big rock feature came up. I knew I wouldn't be riding it, but wouldn't mind getting some snaps of the others. 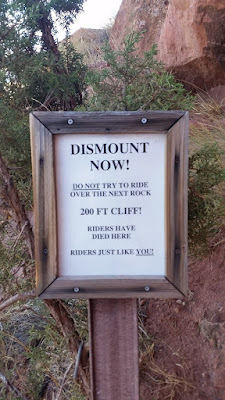 We rode off and before any of us knew it we were at the rock drop. The German guys didn't stop, just went for it and cleaned it. I then saw Kelly disappear in front of me as she dropped in, from my vantage point it looked like her bars turned and I thought 'Uh-oh!!'. As I came to a stop, she rolled out, unscathed to high-fives. All I saw were huge ledge drops, a bit above my comfort level!! We rode out the remainder of the trail and I did ride a bunch of stuff that I had walked on my Voodoo the previous year. We were all pretty stoked when we reached the car. We bid farewell to the Germans and went into town for a late lunch. 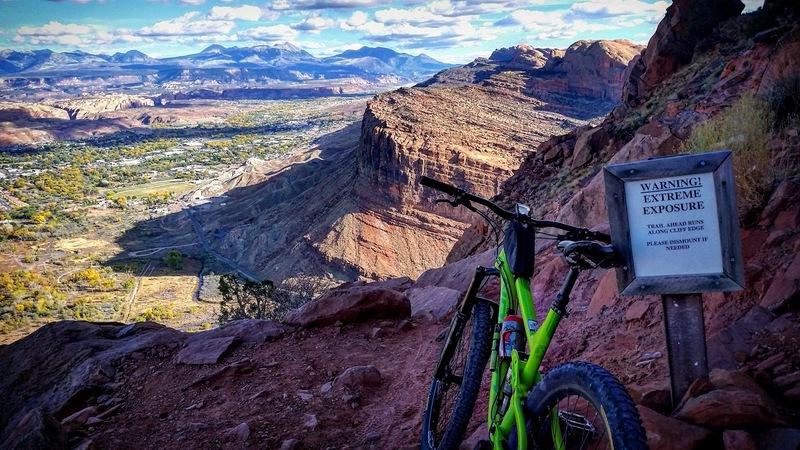 There was still plenty of daylight remaining, so why not head back out to the trails? 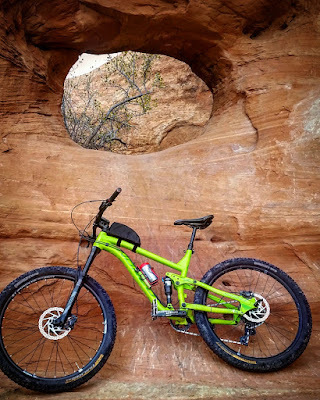 We dialed up a short 10 mile loop over on Navajo Rocks. 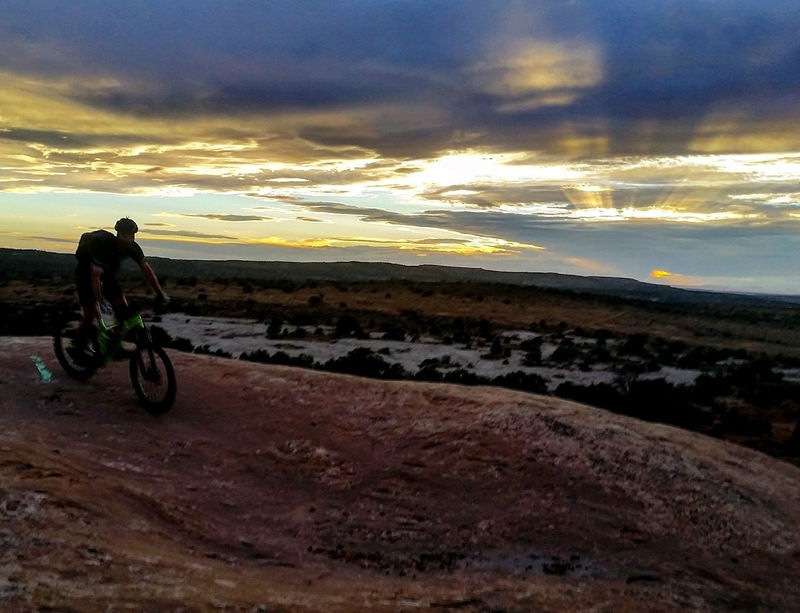 We heard it was relatively easy terrain and we wanted to beat sunset, no need for night riding here. Kelly started to head back to the car after a few miles, then had a change of heart. 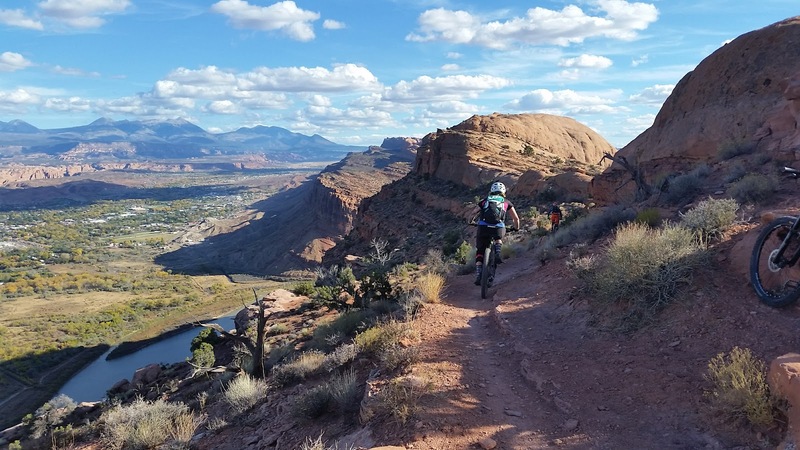 Good thing, as we would've missed this sweet shot of the glowing La Sal Mtns. One more quick photo op in the dying light. Photo by Kelly. 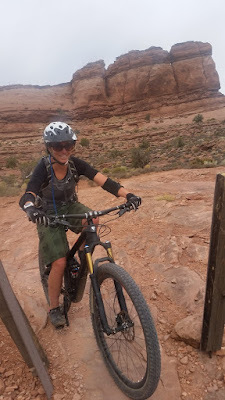 The trails were indeed fun and much faster than our earlier loop. As the light & visibility faded we gained confidence that any surprise drop offs would appear. 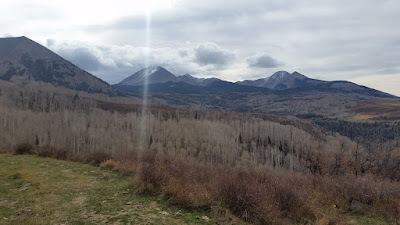 Right about the time I needed lights, we dropped back into the trailhead. Perfect. We found nearby showers at a campground and hustled to beat the water shutoff at 7:30!! It was so nice to be clean after a good day's worth of riding in dusty terrain. 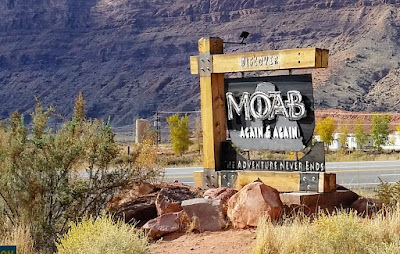 Moab knows this. We then rolled back out to Willow Springs and found a better camping spot for the night only a few feet up the road from the previous location. I was feeling a bit anxious going into our Saturday ride, a shuttle from town for a run down Mag7. 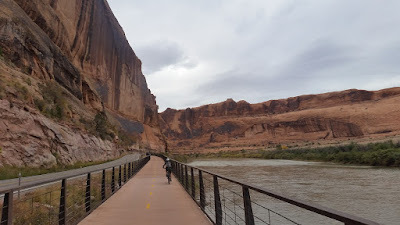 It was the end of this ride that gave me pause, the Portal trail. Youtube it. 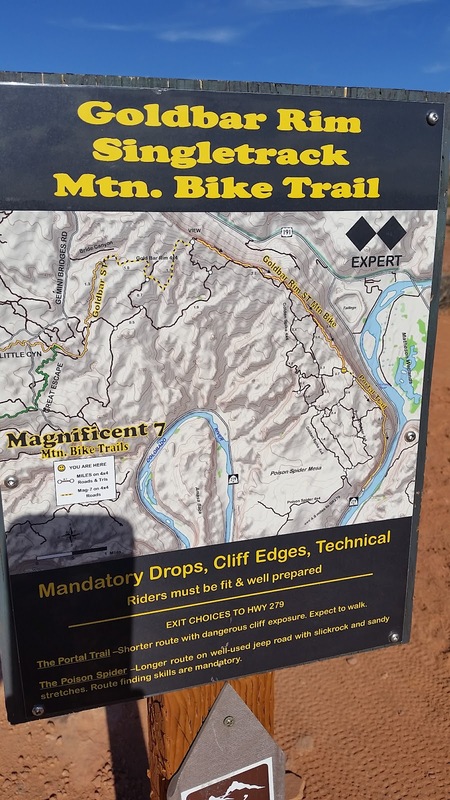 I had seen videos and heard about the extreme exposure and even deaths on this trail over the years. I also knew Kelly wanted to ride it and had done so before. 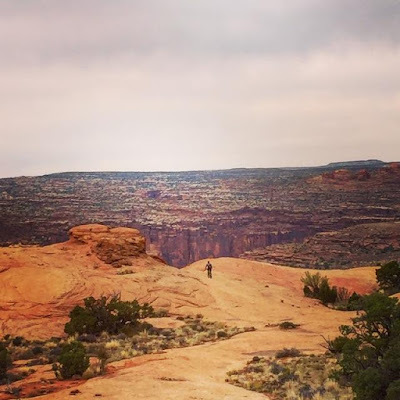 I tried not to dwell on it and knew I'd walk any sketchy bits anyway, but first we had to get to it. 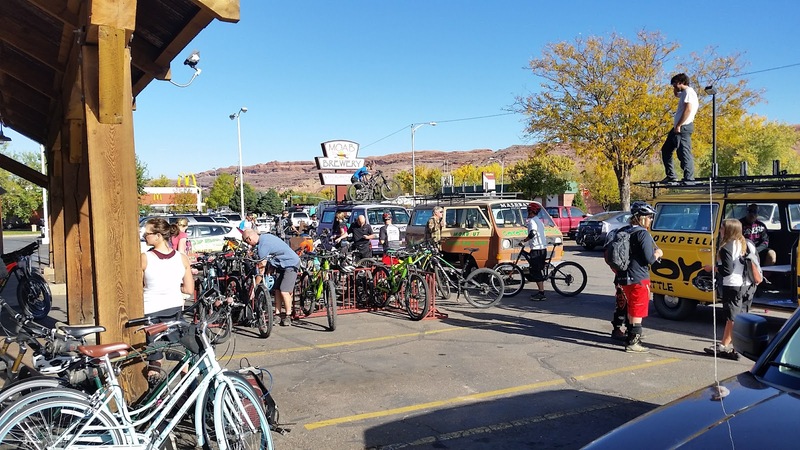 Chile Pepper Bikes was hopping when we arrived. 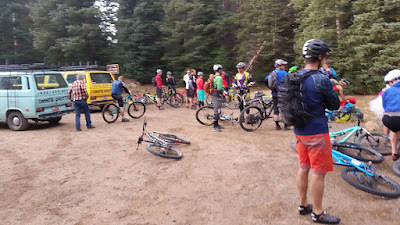 Our shuttle at the dropoff spot, along with at least 200+ other riders. It was crazy. We bolted the trailhead as soon as we could and caught up to a group of riders along the trail. 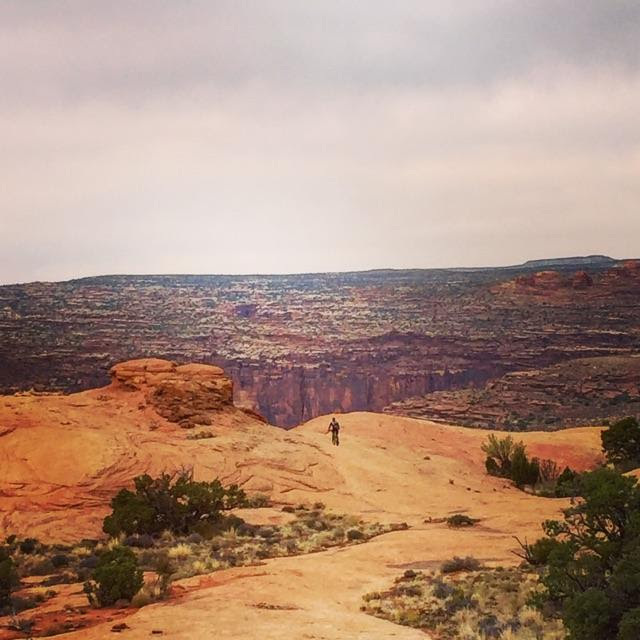 They eventually pulled over and we had the trail to ourselves at least for a bit. We passed another large group and once again the trail crowds thinned out. The first few miles were good for me, got my legs warmed up and gave me more confidence handling the new bike. I was feeling more comfortable on the bike with each passing mile. 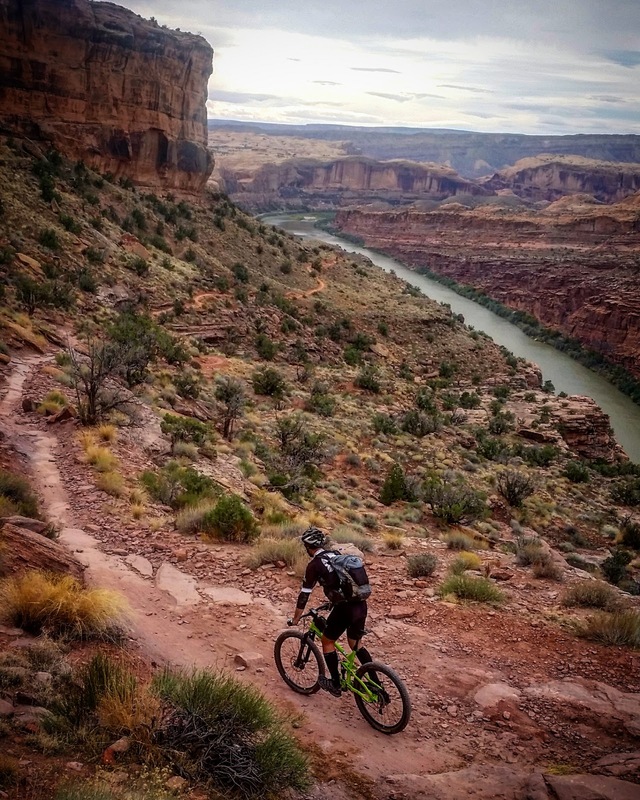 A confluence of trails & riders. Most went straight, we diverted off the Mag7 route for one trail. Such a wonderful place to ride bikes. 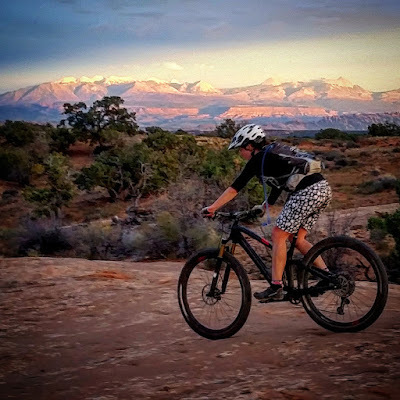 Sun shining on the La Sals, would it be enough to melt the snow up top? 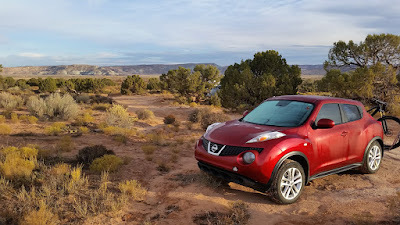 We dumped off the trail and onto a 4x4 road for a bit. There were three motos up ahead checking out a line down a rock face. There was some jockeying among the moto riders, but one fella lined it up and went for it, cleaning it smoothly. 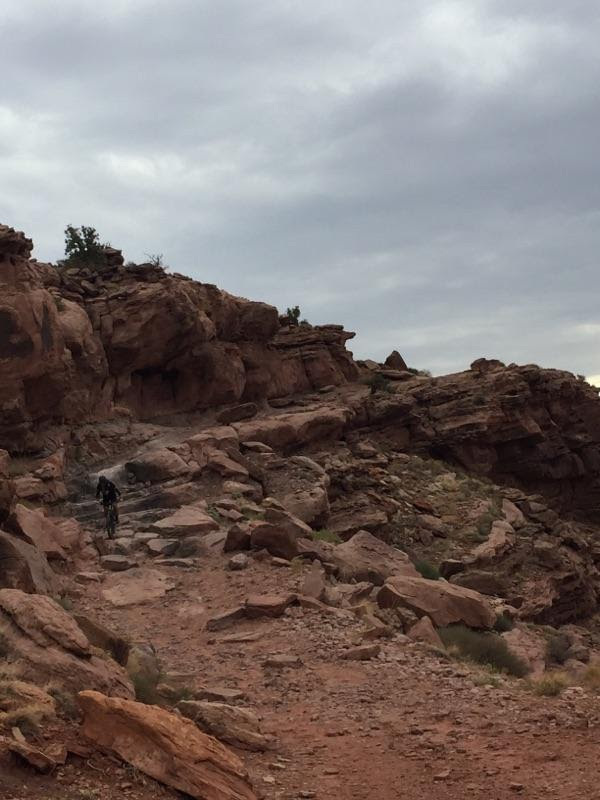 The two others had different ideas and I helped them download their bike over the boulders. Meanwhile, Kelly was gearing up for her own run down. We set up a couple of small 'guide stones' for visual reference, then she nailed it making it look way too easy. While it's a cool pic, I wish I would've snapped a few - one up higher to show the steepness better. A couple of miles later the trail bottomed out on a landing pad of sorts next to a fence. I wasn't exactly sure where our next move was. We figured out where to point our tires just as a large group was catching up to us. I think it was the second guy in the herd, but he launched off a lower drop and instantly blew his rear tire off the rim!! BOOM!! It startled everyone, sounded like a gunshot and he went down kinda hard on the slickrock. 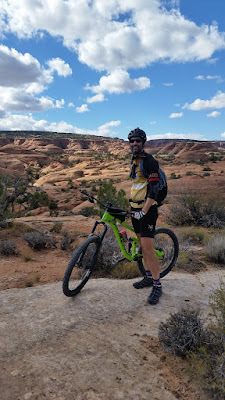 The tire was wrapped around the rear triangle of his bike and he commented about his arm hurting, but otherwise looked ok.
We rode on and I was warned about an upcoming slog of a climb to reach Goldbar Rim. At first it wasn't bad, almost all rideable. We were joking about how good the climb was, but after a short descent the subsequent uphill refreshed Kelly's memory of why it was a slog. 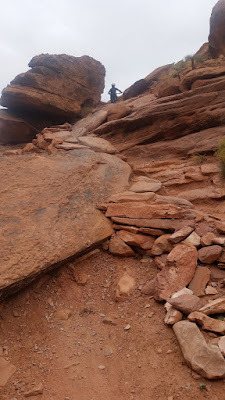 It was a series of super steep long slickrock sections with some rock slabs thrown in for good measure. 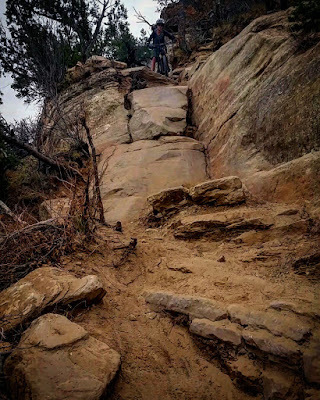 I rode some of the pitches and even cleaned one healthy multi-slab section, but overall it was a bit much for my legs/lungs. We started to see a bunch more riders through here and it was good watching a few of them grind all of it out while the rest of us pushed on. I think the entire climbing section took us about an hour or so, but we did finally reach the rim...and what a sight it was. Ok, I guess all that pushing was worth it. I can fly!! Photo by Kelly. Kelly & I swapped photo op locations while this random dude held onto my phone & snapped a selfie, Ha!! Thanks!! This was so close to being a handstand shot!! This is a good illustration of how rough slickrock can be. I was very glad to be on a full suspension bike riding over this stuff almost as much as the larger drops. The trail or dots roughly follow the cliff edge for miles. 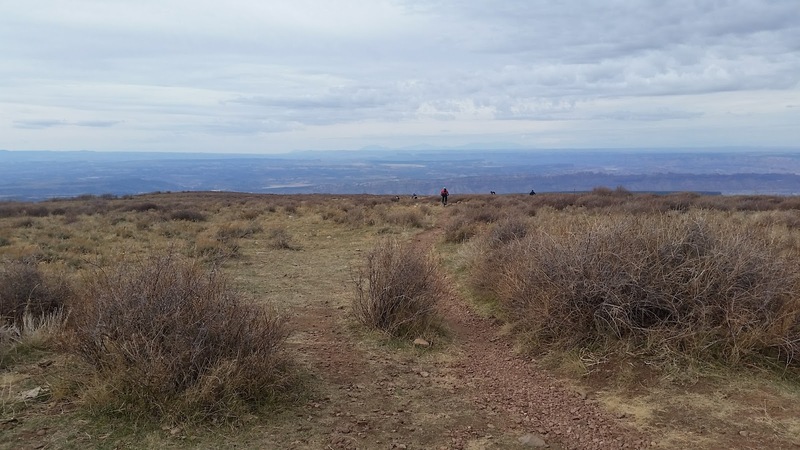 Keep your eyes peeled for either blue or yellow paint markings on the Blue Dot trail. Not sure if the yellow markings are re-routes or signaling a change in difficulty. We simply have to ride down to the left of the bridge, I can see my car!! High above US191 looking north. This sign marked the end of Goldbar Rim. 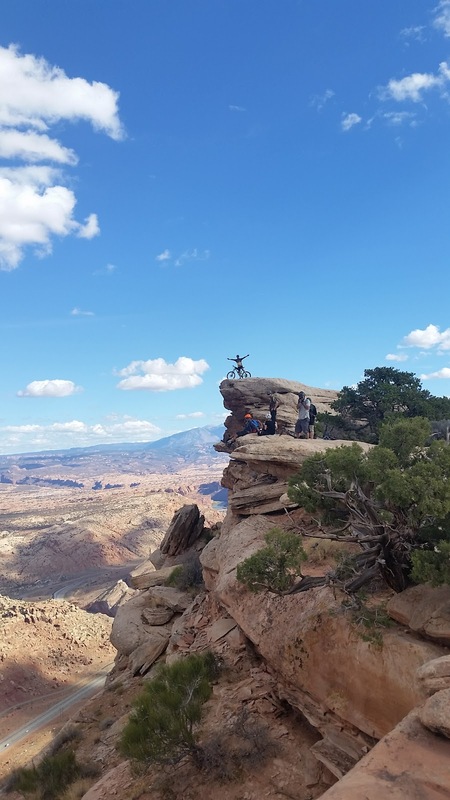 I stopped for a quick snack break with a couple of fellas we had been leapfrogging on Goldbar Rim. Kelly kept moving onto Portal trail and I'd catch up at the bottom. 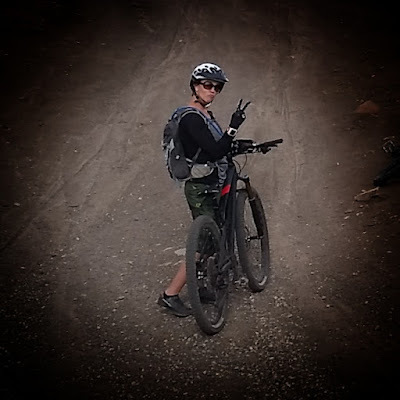 My anxiety crept back in as I rode toward the Portal trail entrance. Again, I vowed to take it easy all the way down. 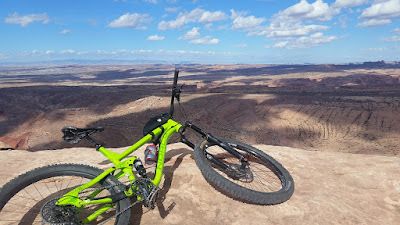 Huge sweeping vistas all the way down, but don't look while riding!! The first bit of trail was really nice, tame actually. Then I came to the middle portion, but overall the trail was fine. I did walk a few tech features. The infamous Portal sign. By itself, the rock ahead isn't anything crazy, but if you stall out or get bumped off-line, it could be trouble. So, I walked. Then a rider came up behind me and cleaned it with ease. The lower Portal trail had plenty of tough rock features, just not the high penalty for failure. I rode most of it and was feeling pretty darn good on the bike. I rolled out onto the road and found Kelly with the riders from earlier chilling in the shade. We didn't die on Portal!! 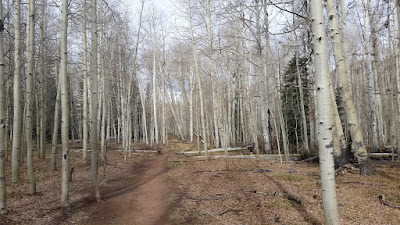 The trail really wasn't bad at all and I'd definitely ride it again. The road spin back to the car was so relaxing after getting beat up on the trail all day long. We grabbed an early dinner in town, got cleaned up and picked up some firewood in hopes of nabbing the same camping spot from the night before. We were also running a bit low on water, but Kelly remembered a nearby spring and we topped off there which was a really cool find. Not the greatest shot of Matrimony Spring, but I snapped this while riding the following day. It's the larger opening under the rock slab. We did luck out and get the same camping spot, but my stupid lighter wouldn't work!! There was a group nearby with a blazing fire and I quickly bartered a Yuengling brew for some flame, the fella was from PA, so he really appreciated it!! Our shuttle on day3 was an early one, 8am. So we had to set an alarm and get going before first light. 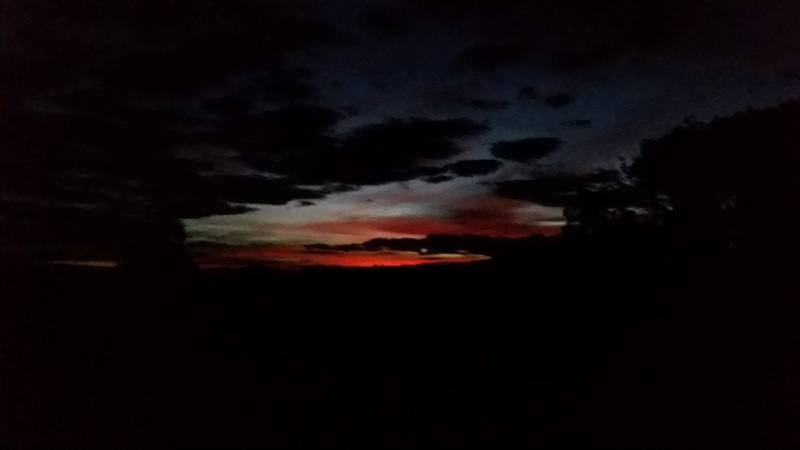 Incredible pre-dawn view from camp. 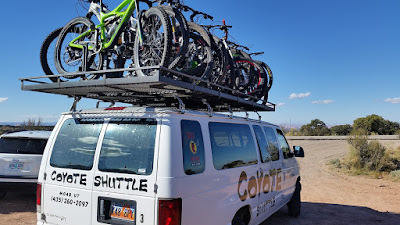 We arrived over at Chile Pepper Bikes once again and loaded onto the shuttle. 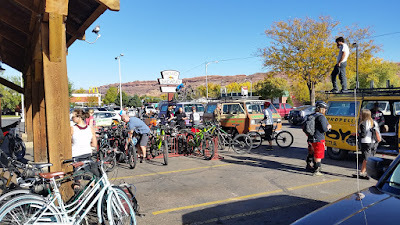 Again, the place was buzzing with activity and there were two shuttles loaded to capacity for the Whole Enchilada route. We also were informed that we'd be going to the top: Burro Pass, for the drop off. We really thought we'd get dropped off at Hazard County, the second from the top. 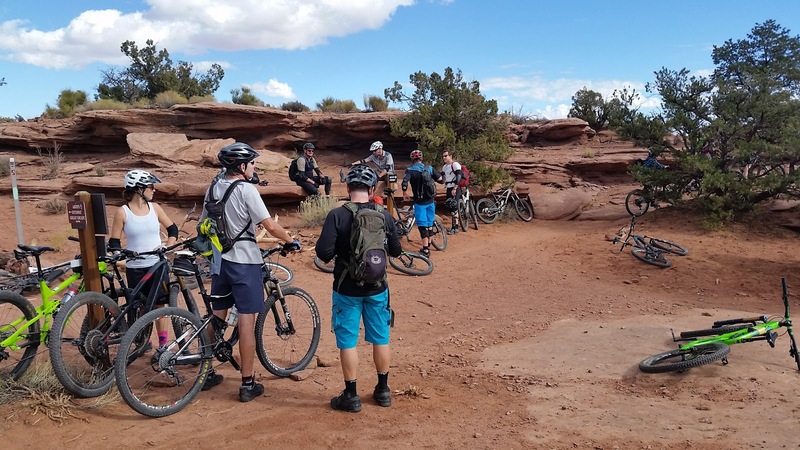 Oh well, more riding and a later arrival back in Phoenix. We set a goal of 6 hours for the day. It was a long drive up the mountain, changing landscape from arid desert to high alpine and a sprinkling of rain!! The van parked at over 10,000' and we took off as soon as we had our bikes. Let's GO!! We did our best to get out in front of the crowd. 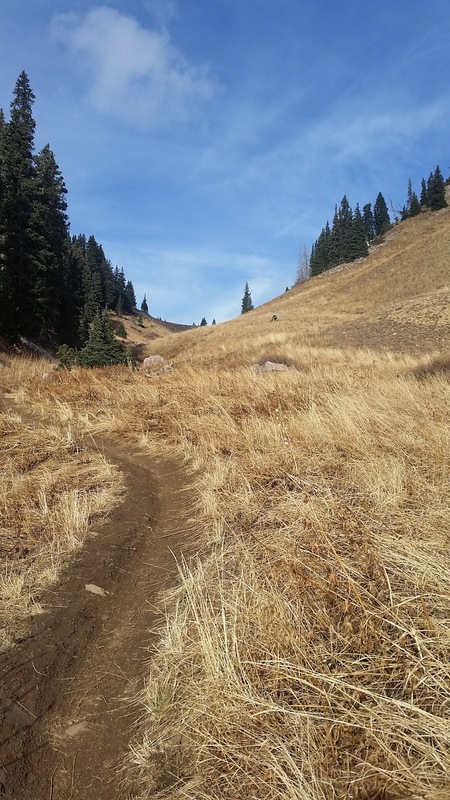 Nice buffed out singletrack to start. 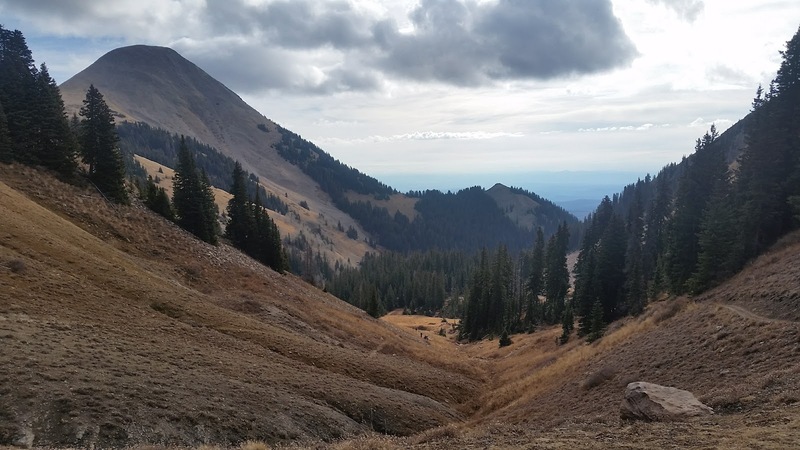 Almost 1 mile to the high point of 11,400'. There she goes, dropping me on the climbs too!! Only a little bit of mud and snow patches. 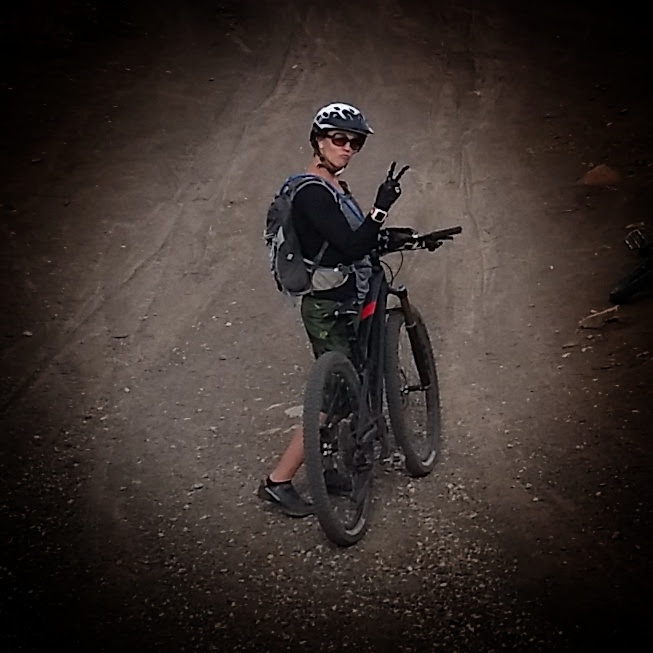 Hike-a-bike should be my middle name. Photo by Kelly. 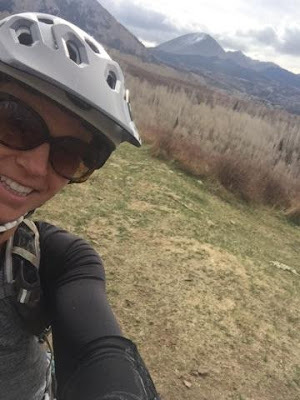 I was really feeling the altitude, but so glad to be at the top!! Time to begin our 7000' descent into town. 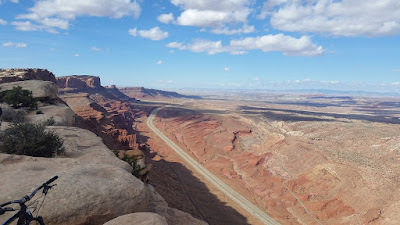 The view from Burro Pass. 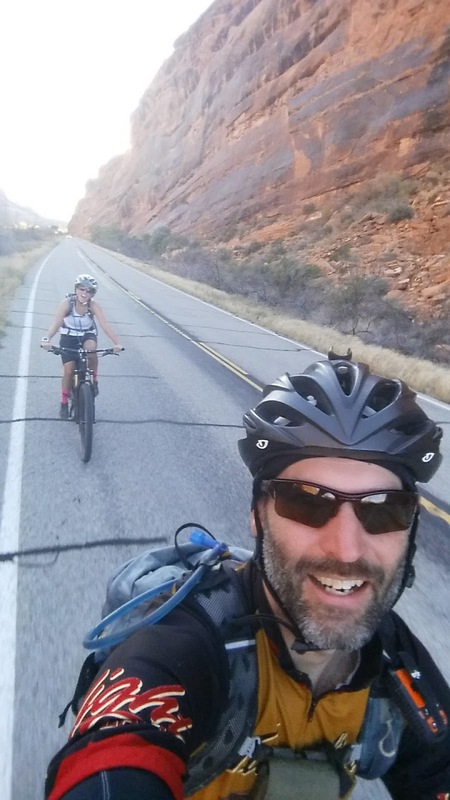 This is the part of the story where I tell you how I kept up with Kelly's wheel or at least had her in view as we ripped down from Burro Pass. Reality check. Kelly was gone in the blink of an eye as I poked along the damp soil and roots. 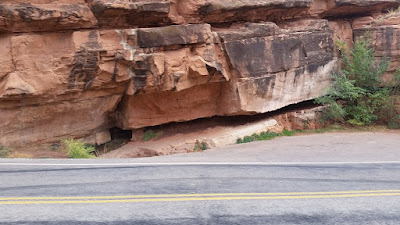 I love some good switchbacks, but there were a few I had to stop & re-adjust. Then as I became more comfortable guiding the bike over the roots, my front wheel slipped off and I went down hard on my right shoulder, knee and smacked my head good enough to dent the helmet!! It all happened so fast. Dropped like a lead balloon. No time for my cat-like dismounting skillz on this one. 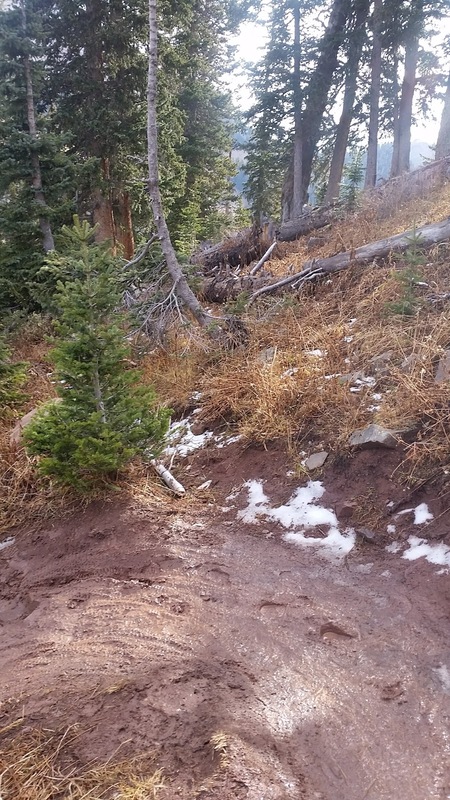 I shook it off, but was definitely more cautious until the trail dried out. Right about that time my chain got sucked into the cassette. I stopped quickly and was able to untangle it in a minute. 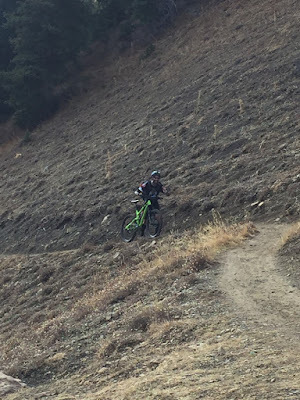 I started my downhill once more and was just cruising along, seriously, not pedaling whatsoever when the chain got sucked in again!! Gah!! This time it locked up the wheel before I could come to a stop on my own. It was in there something fierce. Not good. Not a good start to my TWE downhill. A crash and two chainsuck incidents!! 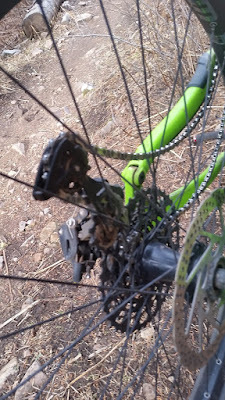 I futzed with the wheel for a solid 15 minutes before I was finally able to get the chain free without breaking any spokes. I figured for the rest of the day I simply wouldn't use my smallest gear. It's all downhill anyway, right? Right. 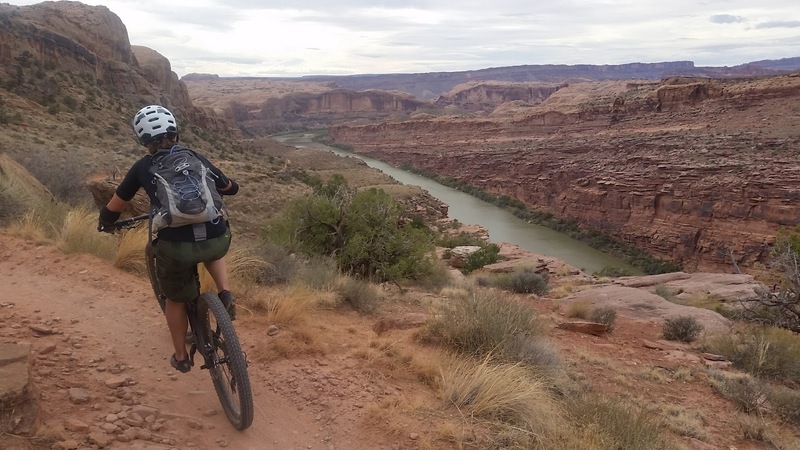 The question now was, how far down the trail was Kelly. 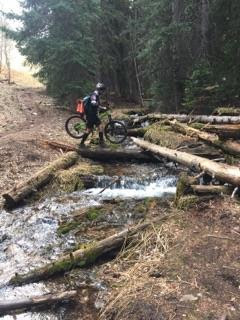 Luckily she found a nice spot by a small creek crossing not too far down that kept her entertained with riders either almost crashing into the water or slipping off the slick log bridge!! At least I walked safely across the creek! Photo by Kelly. 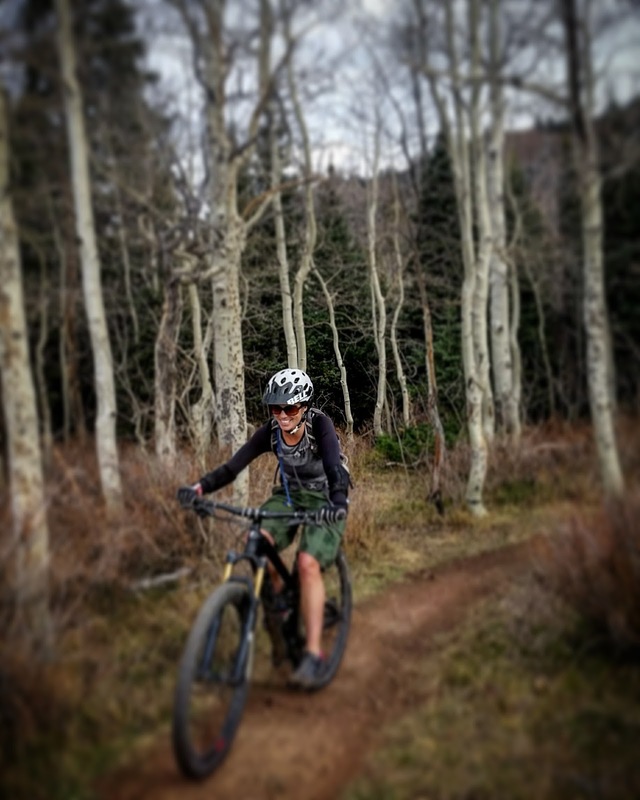 The next portion of the ride was really cool, huge aspen groves on fast singletrack!! I wasn't fast enough of the shutter to catch her!! Gone!! Selfie time while waiting for John to catch up!! Starting to get a sense of how far down the mountain we've come. We rolled through the Hazard County TH with a few other riders, made a nice climb to one last aspen grove. Lovin' it!! 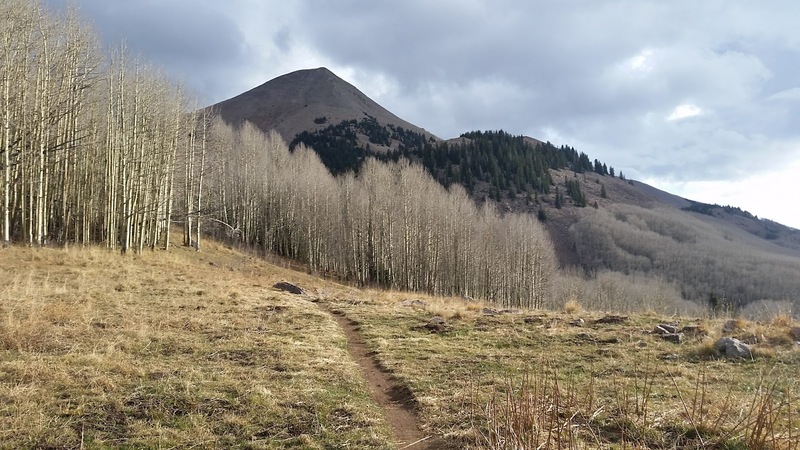 Like a line drawn in the sand, the trees disappear and miles of bobsled type trail open up. This section was a hoot. It was a few miles long and we were going to meet up at the jeep road crossing. 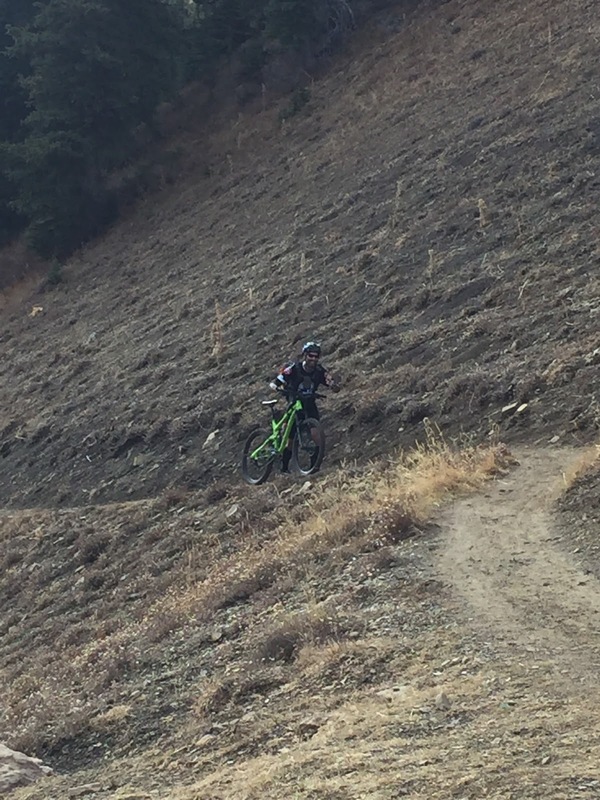 I kept Kelly in sight for a little while, then focused on hitting a few of the jumps littered about. Super fun!! The trail kept going, going, legs beginning to feel the burn. Near the end I could hear a few guys slowly gaining on me, but I was determined to not get passed. I held them off over the last mile or so until I could finally give my quads a much needed break at the road crossing. Met up with some bright bikes with gold chains. We now had a few miles of fast jeep road riding until reaching the UPS trail. 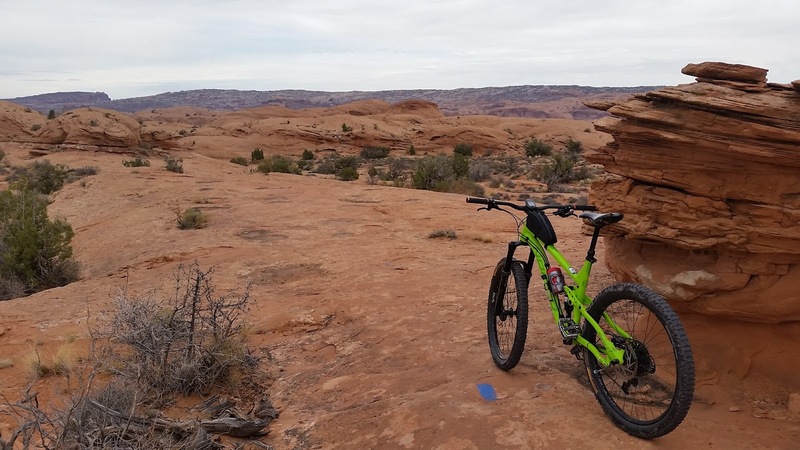 We made quick work of the jeep road section and stopped for a snack at the singletrack split. The whole trip Kelly had been talking about getting redemption on a gnarly bit of trail, the Notch Bypass. 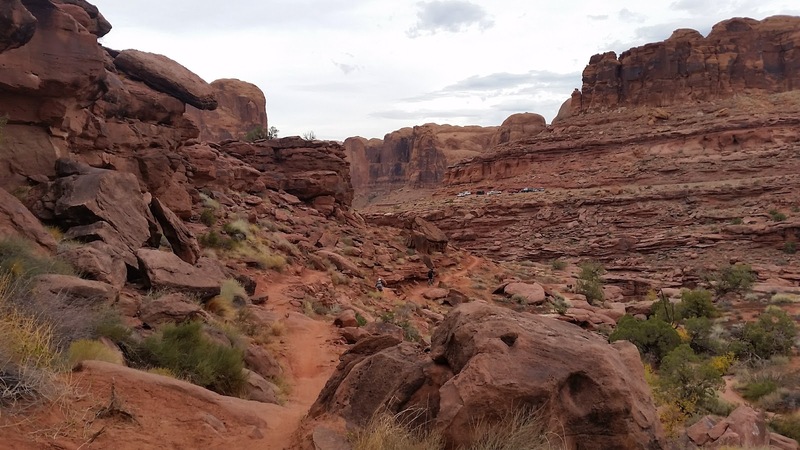 By no means is it easy since it bypasses one of the more famous rock chutes around. I had no intention of trying it, but as we were now only a mile or two from it she was having second thoughts. The only bit of advice I could offer was, if you don't feel it, don't do it. I wasn't going to talk her in or out of it. 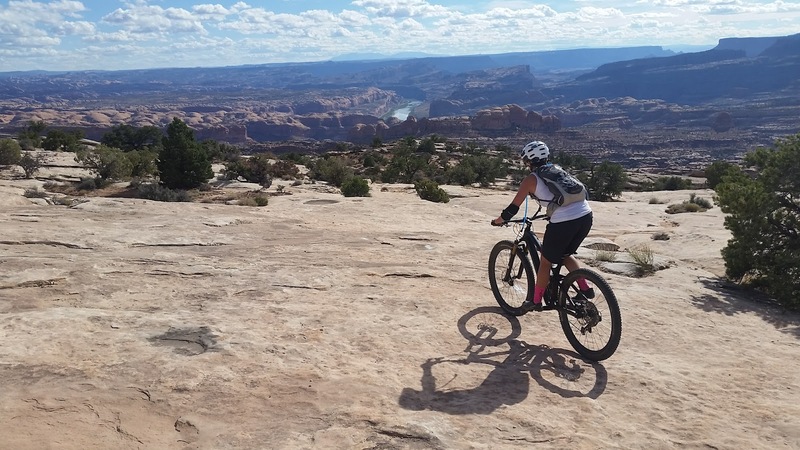 She has the skills to ride anything, but something like that can't have hesitation. But, before we arrived there, we had some of the quintessential TWE vistas to gawk at. Tourist pose. Photo by Kelly. Simply amazing even on an overcast day. The La Sals begin to fade into the background. 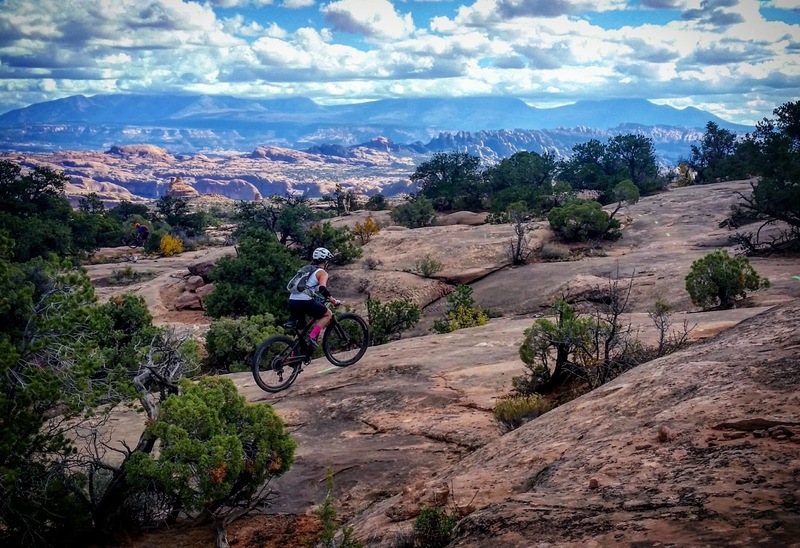 The singletrack quickly morphed into typical Moab red rock terrain. It zigzagged all along the rim's edge, never really getting too close, but still providing awesome views. Then all of a sudden we came to the bypass. I walked down the first switchback with a couple other riders, then we fumbled our way down the main drop. It was a challenge just walking down the slippery rock face. Four riders stood up top to watch Kelly give it a go. Kelly lining up the roll in. There's barely 1/2 a bike length to get situated. Yikes. At first I was positioned a bit farther away to get some good footage. I let the video roll for 2 one minute clips while she got ready. Then we decided I should be closer in, just in case I needed to keep her from going over the side. A few more one minute clips elapsed, then one of the guys asked if she was going to do it or not. Dude. 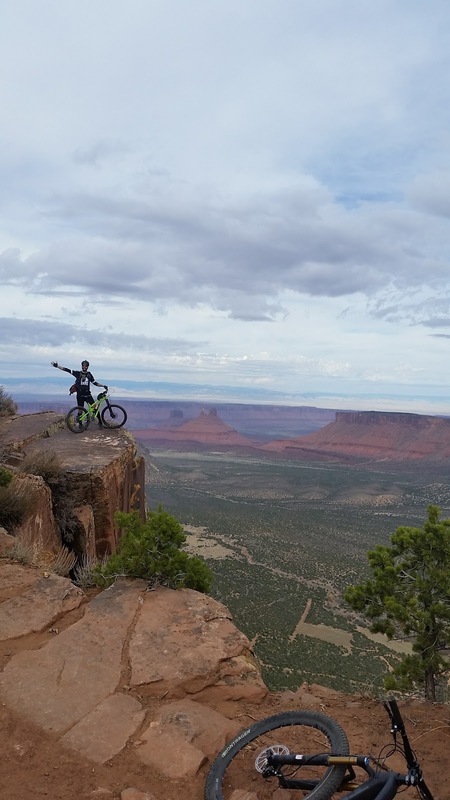 Kelly gladly offered to let him ride it, he balked at the idea and we told him to go on through. As soon as we both realized she didn't crash there were high-fives exchanged!! Sadly, I had to tell the guys up top to at least give this girl a round of applause!! Jeez. 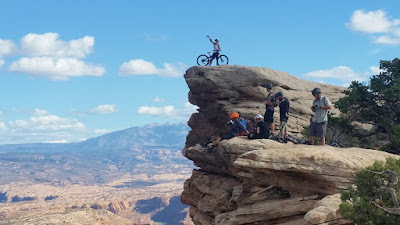 That was by far the gnarliest, gutsiest, riding feat I've witnessed in person. Kudos Kelly, you are awesome!!! She 'asked' if she should do it again for a clean run. No. Let's just end this on a high note. She quickly agreed and we both were buzzing about it the rest of the ride and drive home. 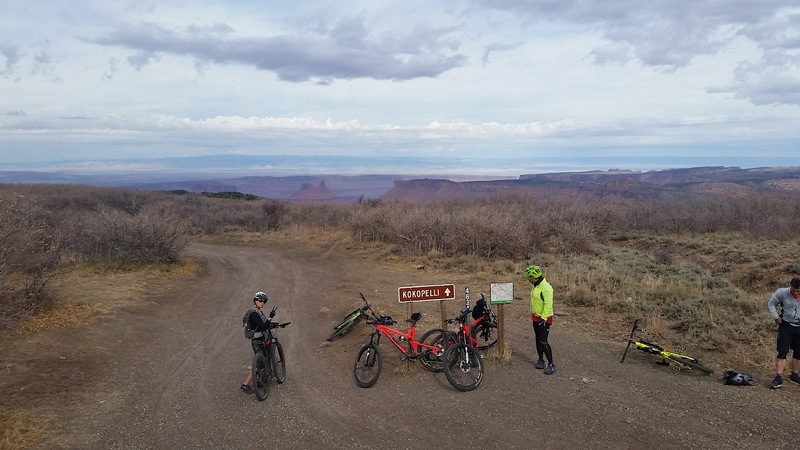 We still had the famed Porcupine Rim trail to ride too! 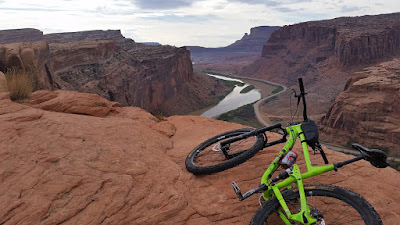 This one had been on my bucket list since my first time in Moab way back in '95, yet I never managed to get to it until today. We dumped back out onto a normal jeep road, slightly downhill, but you could tell where most of the riders tires were going. 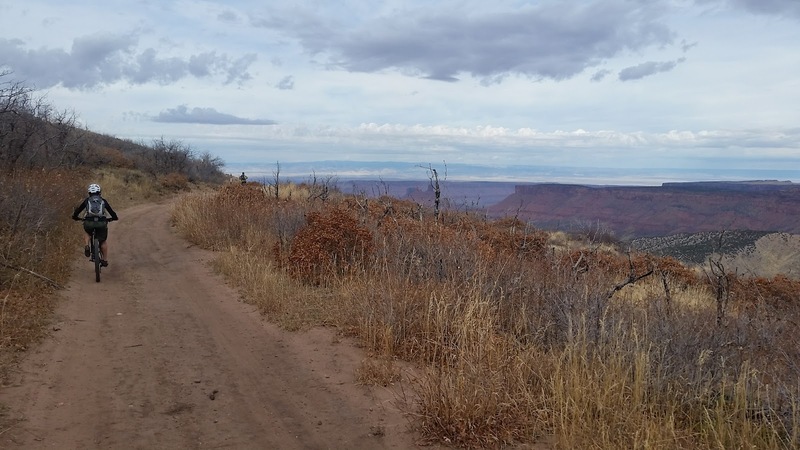 There was practically a singletrack path on this jeep road. We were cruising, maybe doing 15-20 mph with Kelly about 50 feet in front of me. The next thing I knew I was literally flying through the air after clipping my handlebars on a woody shrub next to the road, never saw it. I was in the air long enough to survey my impending doom of a landing. Nothing but large boulders all around. My right quad took the brunt as did my right knee - on top of the scrapes from my Burro Pass crash!! I was sprawled out on the jeep road when an Australian fella we'd been seeing all day rode up. He asked if I was ok, I was, for the most part, and he rode on to tell Kelly what had happened. He told her, 'Your friend got stacked', but she thought he said I stopped for a snack!! She put two & two together when I did stop for a snack after meeting up with her. Ahh, cultural language gaps!! Too funny. Just a taste of the carnage. Again, I was lucky considering how fast we were going. More jeep road ensued as we transitioned onto Porcupine Rim. 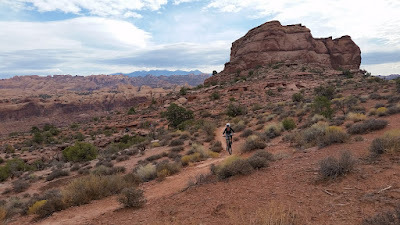 The singletrack was fantastic. There were plenty of rock features to ride and soon we were high above the Colorado River. 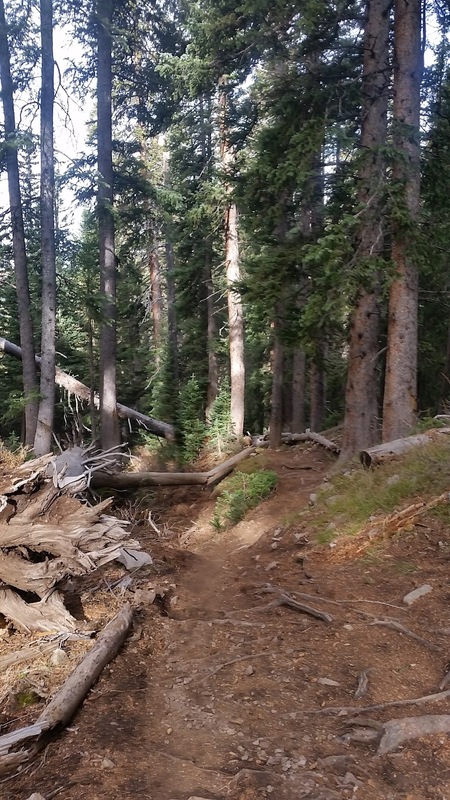 Overall, the trail wasn't nearly as sketchy as I had heard so many years ago. Finally, adding this one to the 'ridden' list. One of my favorite snaps from the weekend, great eye Kelly. She had to climb up a rock to get the shot. More sweeping views of the Colorado River. There was one more big rock feature coming up that Kelly wanted a crack at. 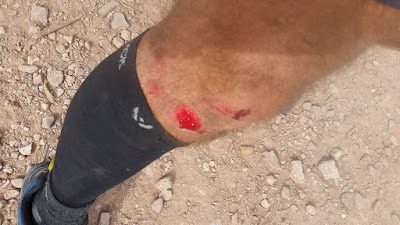 While I was feeling really good on the Norco now, I didn't want to risk a third crash on the day. She rode it clean, but not as smooth as she would have liked. I thought it rolled rather nicely, but she's a tough self critic. 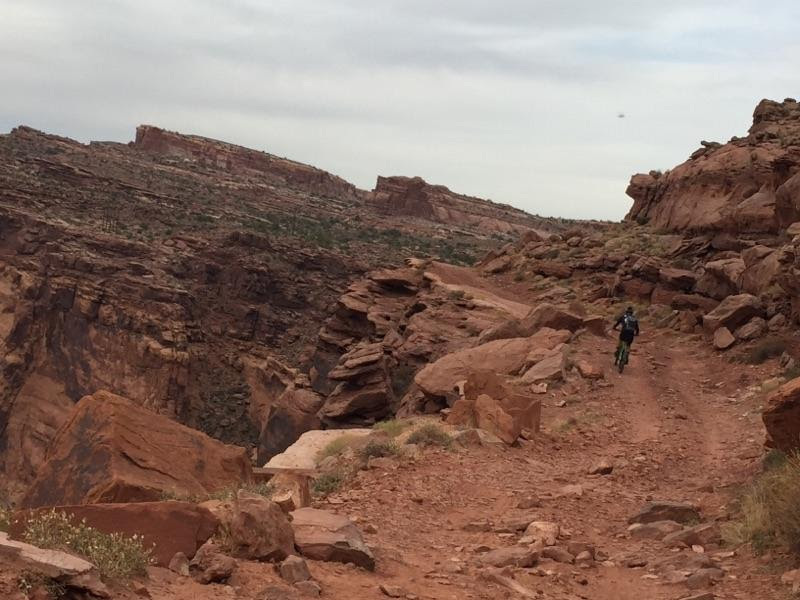 Here's the line: slightly rider's right, then almost 90º left exiting the frame about halfway up the right side. 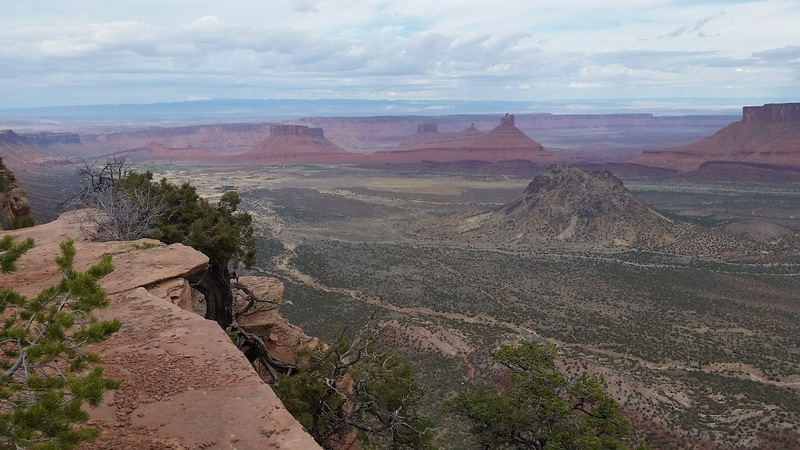 Just like that we were done with Porcupine Rim and The Whole Enchilada. We hit the road a few minutes after 5 hours on the trail. Now we only had a flat 8 miles or so of paved riding back into town to drop off my bike, easily beating our 6 hour goal. It was around 2:30p. Almost exclusively on bikepath all the way back to Chile Pepper Bikes. We changed, cleaned up a bit at the bike shop then grabbed some tasty grub from a food truck in town before hitting the road around 3p. It was a bit of a whirlwind trip, but I'd do it again in a heartbeat. Maybe rent a different bike for comparison's sake. 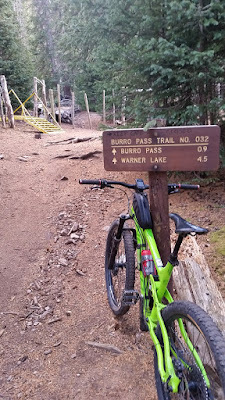 I really liked the Norco, but would be curious to see how I liked a full squish 29er on those trails. We ended up tallying 4 rides in 3 days, 87.3 miles, 8500' of gain & 16500' of elevation loss!! That's a lot of downhill miles!! 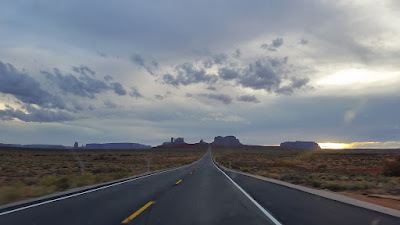 Monument Valley is always cool, even at 80mph!! Thanks for coming along Kelly, for once it was me doing all the crashing and mechanicals. It was bound to even out eventually. We even made it back to Phoenix by 11p!! I wouldn't mind doing this kind of 3-day weekend more often. 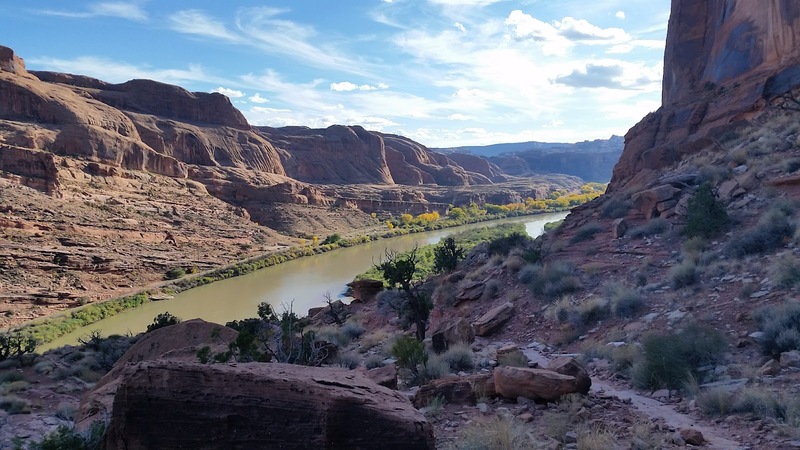 Perhaps Gooseberry Mesa next? ?